The pathogenesis of acne is multifactorial and can be associated with four contributors: follicular plugging, excess sebum, inflammation, and the presence of Propionibacterium acnes (P. acnes). P. acnes are a naturally occurring bacterium that is present on the skin, as well as within pores and sebaceous glands, at all times. When dead skin and sebum become trapped and block the pores, P. acnes rapidly multiply, causing follicle damage and inflammation. Once inflammation develops, the degree of acne evolves, forming papules, pustules, nodules, and cysts. BBL acne treatment is a great alternative to acne medications, both topically or orally administered, which tend to have a number of side effects. Fortunately, with modern advanced science there are now new laser acne treatments available utilizing the state-of-the-art technology. Throughout its lifetime P. acnes bacterium produce porphyrins. The blue light will cause photo excitation of these P. acnes porphyrins. This will form singlet oxygen within the microorganism itself, leading to the selective destruction of bacteria. Shorter wavelengths (blue light – 420 nm) are capable of the greatest absorption that specifically target bacteria; whereas longer wavelengths (red light – 560 nm and 590 nm) produce deeper penetration into the skin, targeting inflammation. The heat soothes the acne lesions, initiating a natural healing process that causes the rebuilding of a new collagen in the skin with smoother texture and improved acne scars appearance. 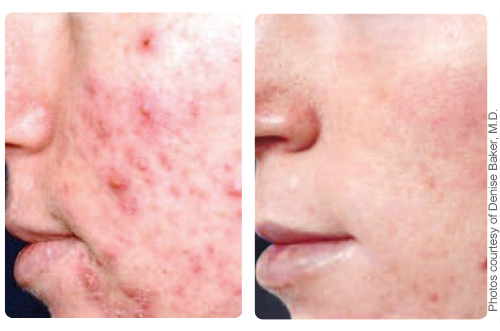 Considering that P. acnes is rarely present without concomitant inflammation, the treatment combination of blue and red light plus the heat has demonstrated considerable success in treating mild to severe inflammatory acne. During each treatment session clients may feel a slight tingling sensation. Recommended initial course: 1 treatment every week for 6 weeks. Destruction of P.acnes continues for a few weeks following the last BBL treatment and the effects of the treatment will be maintained until bacterial populations rebuild to their initial concentration. BBL acne treatment can be performed not only on the face, but on the back, shoulders and chest as well. Avoid sun exposure for at least four weeks before and after treatment and wear a sunblock of SPF 30 or higher daily. If your skin is tanned - wait until the tan is fully faded before starting a treatment. Avoid exercise for five days after your treatment. Avoid hot baths, excessively hot showers, steam rooms, hot yoga or sauna for five days after your treatment. Medications or herbal supplements such as ibuprofen (Advil), aspirin, vitamin E, fish oils thin the blood which can result in purpura. Retinoids, hydroquinone, alcohol and acid-containing skin care products should also be ceased at least 1 week before and not be used until at least 1 week after treatment. 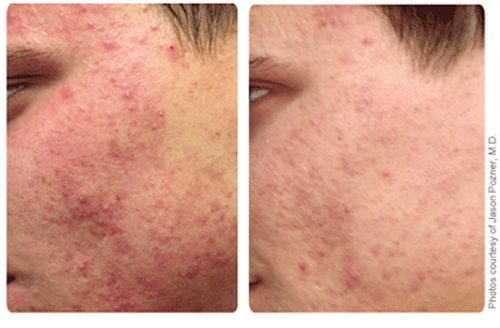 Clients who took Accutane should wait at least 6 months prior to treatments. Post treatment care guidelines depend on the condition treated, and should be discussed with your BBL practitioner.